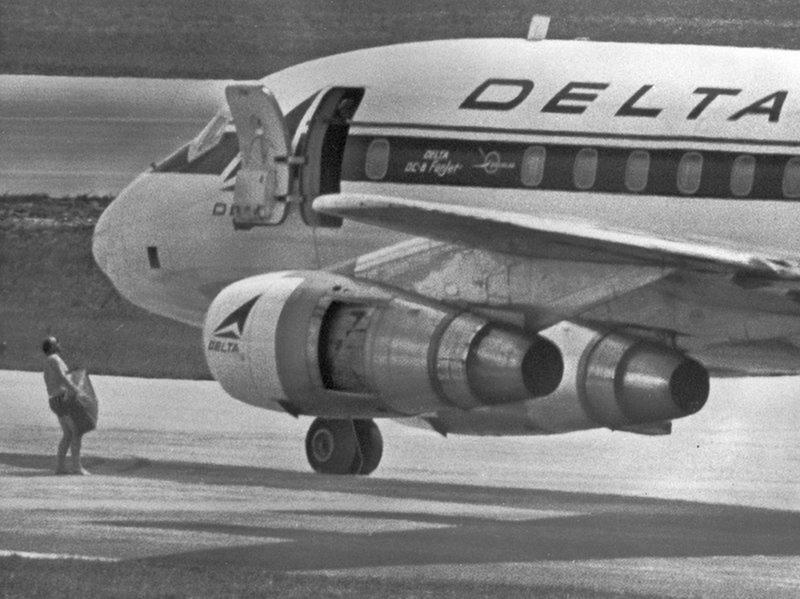 In 1972, a man held a pilot at gunpoint on a plane loaded with 86 passengers. He asked for a million dollars in cash – the largest ransom ever received by an airplane hijacker in the United States. Then forced the plane to head for Algeria and escaped. Eventually, he was caught in September 2011. Above - July 1972: A photo of an FBI agent, clothed only with a pair of swim trunks, as instructed by the hijackers. He holds a case, containing a $1 million as ransom, to the opened door of the hijacked plane Delta DC8 in Miami. After that, the jet took off for Algeria. George Wright, a convicted felon and 1970s militant, was one of the hijackers. Wright primarily became notorious in 1962 when he took part in murdering Walter Patterson, gas station owner in New Jersey. According to Asbury Park Press, Wright and three other companions shot and killed Patterson and they robbed his Esso station in Wall. The culprits escaped with about $70 but they were caught after two days. Wright was sentenced a prison term from 15 to 30 years. In Leesburg, N.J., he and two accomplices managed to escape from their prison in 1970, and boldly stealing the warden's car as a getaway vehicle. This was reported by MSNBC. Wright winded up in Detroit then joined the Black Liberation Army. Allegedly, he got a part-time modeling job by using an alias. On July 31, 1972, authorities recognized him disguised as a priest. Wright and four members of the BLA seized a Delta flight bound from Detroit to Miami. Reports from CNN notes that the group held 88 people as hostage on the Miami tarmac before federal agents brought the one million dollar ransom. The agents were compelled to wear swimming trunks as they delivered the cash due to the hijackers' demand. The hostages were released but the pilots were to fly Wright and the other hijackers on to Boston, where an international navigator (who had to wear swimming trunks as well) boarded the plane; then they maneuvered on to Algeria. According to AP, Wright and his accomplices sought political asylum, but Algerian leaders never authorized it.